While pollution is almost everywhere, certain communities are burdened with a disproportionate number of facilities that fill the air, soil, and water with contaminates. Typically found in communities of color and low-income communities, industrial polluters such as landfills, trash incinerators, coal plants, and toxic waste dumps affect the well-being of residents. Their health is also often compromised due to a lack of access to healthy foods in their neighborhoods. Those who work on environmental justice issues refer to these inequities as environmental racism. Environmental Justice activists approach environmental protection in a different way than those groups that focus solely on environmental issues. These activists consider the environment to be where “we live, work and play, go to school (and sometimes pray).” They act to right the wrongs of environmental racism, which is typically due to the intended or unintended consequences of regulations that may be selectively enforced or not enforced at all, resulting in negative impacts on people of color. When they hear about industrial pollution, people often think about factories with billowing smokestacks. 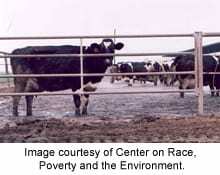 However, the food industry, with its factory farms and slaughterhouses, can also be considered a major contributor of pollution that affects the health of communities of color and low-income communities, because more often than not they locate their facilities in the areas where these people live. “Swine CAFOs [Confined Animal Feeding Operations] are disproportionately located in communities of color and regions of poverty …” say Maria C. Mirabelli, Steve Wing, Stephen W. Marshall, and Timothy C. Wilcosky of the School of Public Health at the University of North Carolina-Chapel Hill. Among the corporations that harm the environment and the health of communities of color and low-income communities are those that run industrial pig farms. Research has shown that these pig farms are responsible for both air and water pollution, mostly due to the vast manure lagoons they create to hold the enormous amount of waste from the thousands of pigs being raised for food. Residents who live near these factory farms often complain of irritation to their eyes, noses, and throats, along with a decline in the quality of life and increased incidents of depression, tension, anger, confusion, and fatigue. In North Carolina, it has been said that the number of pigs on factory farms exceeds the total population of people in the state. The contamination from North Carolina pig farms has yielded dangerous concentrations of groundwater nitrates, a leading cause of blue baby syndrome. Hydrogen sulfide has also caused noticeable increases in respiratory ailments near these sites. 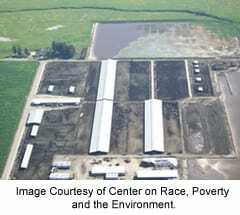 And because of the location of these industrialized farms, those affected most are low-income communities of color. This is not an isolated example. The placement of these facilities is not always an intentional process on the part of industry leaders. Instead, because of the distinct connections between ethnicity and class in the United States, poor rural areas tend to house communities of color and the land in these areas is cheaper. According to sociologists Bob Bolin, Sara Grineski, and Timothy Collins of Arizona State University, “Land use, housing segregation, racialized employment patterns, financial practices, and the way that race permeates zoning, development, and bank lending processes” are also fundamental drivers of environmental racism. North Carolina is one example, but similar patterns exist in most major agricultural areas. Corporations may also locate to these rural areas either believing that the residents do not have the political will and won’t present obstacles, or that these low-income residents need the jobs and will not complain. Environmental Justice activists consider the latter reason to be a form of economic extortion—having to accept the negative health consequences and adverse effects on the environment in order to have a job. This scenario is fortunately not a given with more frequent challenges being made to these injustices. What is often overlooked, however, is the harm being done to the surrounding communities, with generation after generation suffering illnesses caused by the industrial pollution of the land, air and water. The risk to the health of residents depends on rates of exposure. Workers and their families are the most severely affected, but community health is also a big concern. Runoff from factory farms—containing a wide range of pathogens, antibiotics, and other toxic chemicals—can permeate aquifers and contaminate surrounding groundwater sources. Viruses can be transmitted from the workers in these facilities to their families and communities. Moreover, undocumented workers in meatpacking facilities and factory farms are often less willing to participate in health programs that are in place for fear of legal consequences. Air pollution also poses risks to vulnerable members of populations near factory farms, specifically children, the elderly, and individuals with pre-existing respiratory diseases. In particular, epidemiological studies on factory farm emissions show strong correlations between these pollutants and asthma. The results from surveys of rural North Carolina schools also showed strong correlations between asthma diagnoses and proximity to factory farms. Schools with a significant number of students of color (about 37%) and slightly less than half of the student bodies on reduced lunch programs were located an average of 4.9 miles from pig factory farms, yet schools with more white and higher-income students were found to be an average of 10.8 miles away. Significant correlations were also found between race, poverty, and the odor exposure from these pig factory farms. California’s dairy industry is also no exception. More than 1.7 million cows can be found in the state, with most living on mega dairy farms. There is no question that dairy factory farms contribute to air pollution, and the Environmental Protection Agency has been monitoring just how much factory farms do contribute. It is tragic that these communities often do not have access to alternate means of earning an income or to alternatives to animal products or contaminated tap water. They are hurt by the system and have few reasonable choices. Such limitations are an integral part of the factory farming system. With consumers continuing to demand high amounts of factory-farmed “meat,” communities—not just workers, but entire communities—will continue to be hit hardest by pollution and toxins. Certainly plant foods may also be tied to toxic chemical use and abuse as well, but given the huge quantities of plants needed to feed animals raised for food, choosing vegan options goes a long way in reducing our collective “pollution footprints.” Our daily meals offer us the chance to vote with our dollars and stand in solidarity with communities against environmental racism. Environmental racism may take many forms, but when it comes to injustices directly linked to the food industry, we can do our part to not contribute to these unjust actions by choosing a vegan diet. B. Bolin, S. Grineski, and T. Collins, “The Geography of Despair; Environmental Racism and the Making of South Phoenix, Arizona, USA,” Human Ecology Review 12, no. 2 (2005): 156.